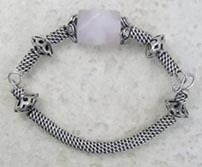 Rose quartz, known as the heart stone, is said to balance the emotions, open the heart and enhance all forms of love. This rose quartz chunky bead measures approximately 15 mm x 18 mm. A smaller gauge, hand twisted, sterling silver wire is used to give a more delicate design that could easily be worn everyday. Liver of sulfur gives an antiqued appearance. This hinged style bangle bracelet measures approximately 7¾ inches and best fits a wrist measurement of ~ 6 - 6 ½ inches. Weight is 1.1 oz. To guard against possible lose of this item, a safety chain has been added.